The new critically acclaimed science fiction drama, about an expert linguist that leads a US military team in trying to communicate with alien invaders. The film was directed by Denis Villeneuve (who's helmed such other critically acclaimed hits as 'SICARIO', 'PRISONERS' and 'ENEMY'), and it was written by Eric Heisserer (a veteran horror flick writer of movies like 'LIGHTS OUT', 'FINAL DESTINATION 5' and the 2010 'A NIGHTMARE ON ELM STREET' and 2011 'THE THING' remakes). The script is based on a 1998 short story, by Ted Chiang, called 'STORY OF YOUR LIFE'. It stars Amy Adams, Jeremy Renner, Forest Whitaker, Michael Stuhlbarg and Tzi Ma. The film has received rave reviews from critics, and it's been a big hit at the Box Office. I think it's a sci-fi masterpiece. 12 alien spacecrafts touchdown around the globe, alarming the entire world population. Louise Banks (Adams) is an expert linguist, that's selected to lead a special U.S. military team in trying to communicate with the extraterrestrials. She's joined by a theoretical physicist, named Ian Donnelly (Renner), and a US Army Colonel, named Weber (Whitaker). The team engages in a desperate race against time, to find out why the aliens are here, before violence erupts around the world. 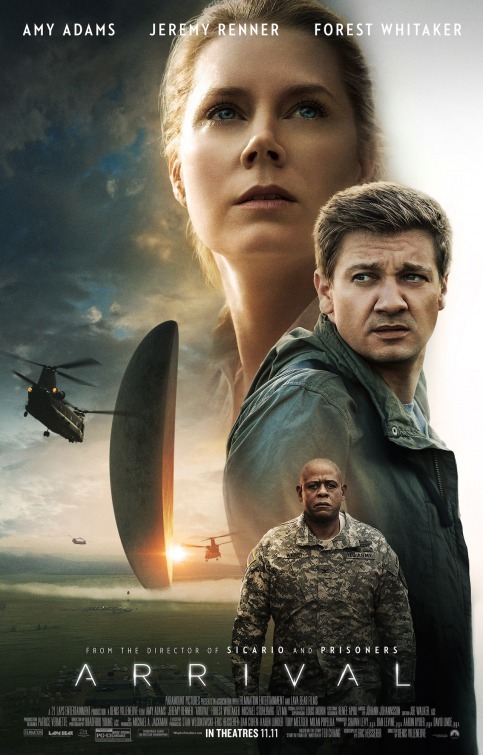 The film reminds me a lot of the 1997 sci-fi hit 'CONTACT' (which was one of my favorite films released that year); it tells a similar story about alien invaders, with a similar strong lead heroine character that's trying to make 'contact' with them. Adams is amazing in the lead role, and Villeneuve's direction is superb. The movie is a little long, and slow-paced in places; but for the most part it's very engaging, and intense, and the ending is absolutely breathtaking (I cried). It's definitely a sci-fi masterpiece, that's for sure.